Our annual ritual of sharing what we have accomplished at the PMC in 2018 and asking for your support continues! Unlike other charitable institutions, we send our appeal letters only once a year, knowing that you will consider them carefully and proudly share in what we have been able to achieve with your help. If you attended some of the concerts and festivals we organized or belong to our worldwide Newsletter audience, parts of this summary may be familiar to you. Nonetheless, here are some of the most important milestones that occurred this year. 2018 was especially busy for us because we celebrated the centenary of Poland’s regained independence. This momentous occasion was marked by Dir. Marek Zebrowski’s lectures on “Paderewski and World Politics” with corresponding concerts of Chopin and Paderewski, presented at the Los Angeles Public Library (January), Santa Monica Public Library (August), Music Conservatory in Lyon and Université Jean Jaurès in Toulouse, France (September), and Polish-Canadian Cultural Centre in Calgary (October). Also on the subject of Paderewski, the Polish translation of Dir. Zebrowski’s book Paderewski in California came out at the end of November, thanks to the efforts of such partners as Wspólnota Polska, the Senate of the Polish Republic and IPN who co-funded this project. Dir. Zebrowski also appeared in concert with the Bydgoszcz Philharmonic in September and Lviv Philharmonic in November, performing Henryk Wars’s Piano Concerto. The manuscript of this work is held in our Archival Collections, alongside other symphonic music by this great film music composer. On the subject of Wars, the PMC and Polish Music Publishers [PWM], together with the Wars family, collaborated on publishing and recording Wars’s symphonic music in Poland and are considering working jointly on a documentary film and a book about the composer. PWM will also publish another item from our Archives—Roman Ryterband’s Sonatina for Guitar—in December. We are incredibly proud of the concerts that we organized this year, not only on the USC campus but across California, and in collaboration with partners around the world. In February, we featured members of the Society of Polish Chamber Musicians (SPMK) from Kraków in USC’s “Music @ Rush Hour” series, featuring works by Chopin, Moszkowski, Fitelberg, and others. A month later, SPMK performed at USC a program of works by Młoda Polska composers. This was part of our “Anniversary Year” plan to present Polish music before and after independence, as was our fall Paderewski Lecture-Recital, featuring music composed during the inter-war period in Poland. Dr. Lisa Cooper Vest, a Thornton School of Music professor, gave a lecture followed by music of Bacewicz, Koffler, Paderewski, Różycki, Szymanowski, and Tansman, featuring the USC Chamber Singers (pictured below) and prominent LA-based musicians. During the past year we have strengthened many partnerships, such as with the Los Angeles Museum of the Holocaust, where we held several joint concerts in February and October. The Los Angeles County Museum of Art proved another great partner by collaborating with us on two concerts of the Kupiński Guitar Duo and pianist Daniel Wnukowski in July. Capacity crowds and standing ovations at both concerts (as well as live radio and internet broadcasts) further cemented the PMC’s position as a hub for promoting our rich cultural heritage in Southern California and beyond. The fall months are traditionally very busy for us and this year was no exception. In late October we welcomed participants in the 2017/2018 Paderewski Festival Cultural Exchange Program. 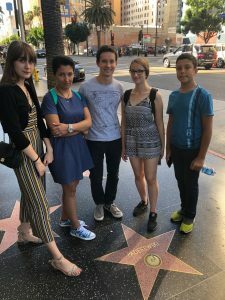 Four young pianists from Kraków, Poland and Lviv, Ukraine and their chaperone (pictured at right) along with two from California were hosted by families in San Diego and Monterey for a two-week stay. The Polish and Ukrainian visitors were also special guests at the 2018 Paderewski Festival in Paso Robles, where they appeared in recitals of solo repertoire and piano 4-hand arrangements of Gershwin with their American friends, then ended their trip with visits to the PMC, Colburn Hall and other cultural destinations in Los Angeles. On the subject of the Paderewski Festival, this year’s edition featured the world premiere of the second stage of a musical about Paderewski, written by a Southern Californian creative team, and a Gala Recital by pianist Kate Liu, a laureate of the 2015 Chopin Competition in Warsaw. The Paderewski Festival in Paso Robles now also presents a “Paso Pops” open-air concert on July Fourth, which has proven very popular with the local audience topping four thousand! For the past four years, we have collaborated with Poland’s State Archives and Archives of Historical Records in Warsaw. Thanks to their extensive support in making available the best experts in the fields of cataloging, digitizing and paper preservation, we were able to host three archivists at the PMC between May and early August. Dr. Robert Górski continued to catalogue and process our Paderewski Collection, while Dr. Wojciech Kowaluk scanned almost four thousand documents and photos. Anna Czajka, a world-class specialist in document preservation, worked with priceless documents, photographs and museum objects in need of repair, repacking them in special acid-free envelopes, folders and boxes. Dir. Zebrowski travelled to Poland in late November for another series of meetings at the Archives aimed at discussing next year’s cooperation, including an exhibit highlighting many unique objects in our Paderewski Collection. Such initiatives aside, throughout the past twelve months, we have answered countless inquiries in person, on the phone and via email, hosted several scholars from across the U.S. and Poland, worked on the monthly Newsletter with our student workers and volunteers, and launched our redesigned website in March. Each of the past fifty-two weeks went by all too quickly, with more and more to do in the coming days and months in order to keep up and fulfill our mission. As you realize, this ambitious program cannot be realized without your generous support, which we ask for only once a year. Our fixed costs include renting USC venues, hiring performers, printing program booklets and promoting concerts, as well as hiring student workers, supporting researchers worldwide, maintaining and updating our vast website, and covering costs for visiting experts. As always, we are very grateful to all those who have supported us financially, attended concerts, volunteered at events, assisted in processing our library donations, or spread a good word about us. We know how important our one-of-a-kind Center is to our Polish-American community and beyond, and how its continued mission enriches the cultural landscape of California and the world. Therefore, each year we ask you to consider making a fully tax-deductible gift to support the institution whose innovative projects have advanced Polish music and culture for over thirty years. As always, your gift will be recognized in our concert program booklets throughout the year. In addition, the first 50 donations of $100 or more will receive a complimentary recording of our October 14 “Sounds of Independence” concert, featuring music by Polish composers from the inter-war period. To donate by credit card, please visit giveto.usc.edu — if do not already see PMC selected, you will find a PMC checkbox under University-wide Giving Opportunities > Centers and Institutes > Music. You may also call us at (213) 821-1356 to give by phone. Checks may also be mailed to 840 W. 34th St., Los Angeles, CA 90089-0851. Please indicate “USC Polish Music Center,” either in the remittance line of your check or in the online form, to ensure that your contribution is routed directly to our department. As always, we invite you to stop by the Polish Music Center to experience the impact of our exceptional programs and learn more about how your year-end gift can advance the profile of Polish music around the world. Please call us at (213) 821-1356 or email polmusic@usc.edu if you have any questions or to schedule a visit. If you are farther away but still want to check in on the PMC, please visit our redesigned website at polishmusic.usc.edu.